With Anemone Tube and Post Scriptvm sharing this split, it is a logical pairing as they have quite individual and distinctive sounds within the post-industrial underground and both tend to frame their musical works around specific and interesting concepts. 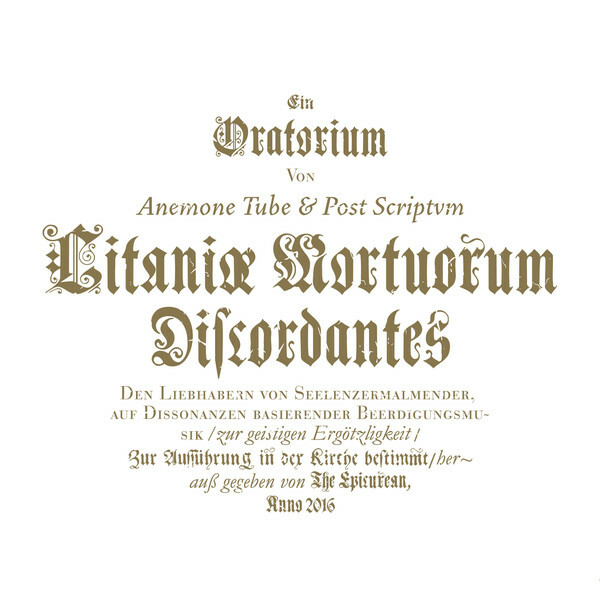 For this release both have structured their works around a single title and conceptual theme of “Litaniæ Mortuorum Discordantes”, which to then quote from the promo blub: “originally applied to a particular style of ancient ritual music, in the Classical era the term Litaniae Mortuorum Discordantes attained a negative connotation and was used to criticize those compositions – which, instead of instilling listeners with the desired pious euphoria, incriminated them with a sense of dread, existential anxiety, feelings of death and decay. Finding this aesthetic choice to be most appropriate for the present era, the two post-industrial projects attempted to create their own “Discordant Death Litanies” for the XXI century”. 3 tracks are featured from each project and with a total run time of 38 minutes. Anemone Tube lead off with ‘Myth and the Relation to the World’, works well to set the scene with a piece of elongated male choral chants and mid-toned sub-orchestral drones which is maudlin in feel rather than overly dark. This emotive edge continues with ‘Recueillement (Sa Propre Mort)’, where the sparse horns are particularly evocative and in line with the themes they on occasion twist and morph towards a discordant resonance (…and being something akin to a disharmonic/ harmonic effect). Noting the sound on the first two Anemone Tube pieces differs quite drastically and where he mood, feel and sound is of almost a modern classical type, on the third Anemone Tube piece ‘Irruption of the Whore’, it charts more familiar territory of looped field recordings which are compositionally layered for vague rhythmic effect, and with its feel of mechanical churn it appropriately sets the scene for the Post Scriptvm tracks which follow. ‘Buried In Fabula’ is the first of Post Scriptvm’s tracks and continues a feel of a slow descent through a soundscape of loose, downward spiraling drones, disembodied voices and general tones of tension and paranoia, and which is further amplified on ‘Dark and Nameless Gods’ with it greater focus on wonky rhythmic elements. With its introductory male vocals chant third and final track is ‘Laterne D’Horreur’ reverts back to the vocal focus of Anemone Tube’s opening piece, before arcing off into an industrialized soundscape and fragmentary noise, sparse orchestral synth pads and other tonal elements representing fleeting glimpse of beauty but further underscored by an atmosphere of decay and rising dread. When contemplating the conceptual framework which this material is structured around, I perhaps expected the material to be more discordant in feel and hellish in sonic execution. Yet this is in no way a criticism of the music itself, which is both evocative and sublime, which by should come as no surprise from both projects. But as always, the benefit of having a strong conceptual underpinning, is the ability of a release such as this to be a multifaceted experience which engage on levels of both emotion (i.e. the music) and contemplation (i.e. the concept). Clean graphic presentation rounds out this extremely enjoyable release, which is also issued on 2 versions of limited vinyl with alternative artwork via the Spanish label La Esencia, if wax is your preferred format. This entry was posted in 2016, dark ambient, experimental, industrial, The Epicuriean by noisereceptor. Bookmark the permalink.